Anglo-Kabarda Horses are russian horsese that were developed by the cross between Kabarda and Thoroughbred horses in the 1920s and 1930s. The goal was to produce a horse that was larger and faster than the native Kabarda, but adapted to the climate of the northern Caucasus region of Russia and able to maneuver in mountainous terrain. They have a Kabarda head with Roman nose profile, straight back, long legs, and well-developed joints. Anglo-Kabarda Horses may have between 25 percent to 75 percent Thoroughbred blood. They are divided into three different types: "basic," "oriental" and "massive." Horses belonging to the basic type are of medium size with a well-shaped head and are well muscled; those of the oriental type are smaller and lighter, they have smaller heads with large expressive eyes and smaller ears and clean legs; the massive type are heavier and taller with a build similar to carriage horses. 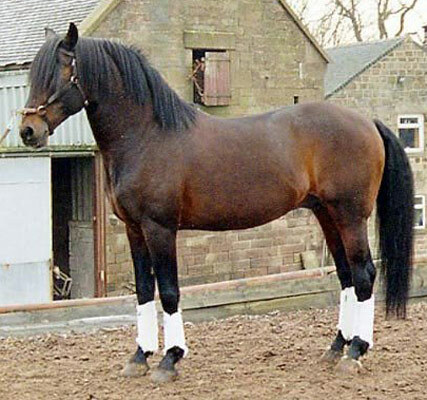 Anglo-Kabarda Horses usually stand between 15.2 and 16 hands (62 and 64 inches, 157 and 163 cm) tall. They have legs which are long and strong with well-developed joints giving them the speed of the Thoroughbred and the resistance of the Kabarda. Anglo-Kabarda horses are known for being energetic, reliable, and spirited but very reliable. As a multi-talented horse, they are commonly used in endurance riding, general riding, jumping, and mounted athletics activities.